The UConn Huskies won their third straight national title this year. Connecticut’s Breanna Stewart blocks a shot attempt by East Carolina’s I’Tiana Taylor. Last month, when my editor tasked me with looking into the stats surrounding the notorious Harvard-Stanford 16 vs. 1 upset from 1998 for ESPNW, I didn’t know much about women’s basketball. When I found that upsets are much less common in the NCAA women’s tournament than in the men’s, my mind jumped to what seemed like a logical explanation: Perhaps the lack of upsets is caused by a lack of depth in the women’s game. In particular, teams like the epically dominant University of Connecticut Huskies — newly minted winners of their third straight national title and the 10th of Coach Geno Auriemma’s reign — must be able to win so much because they get all the best players from a shallow talent pool. Even many who love and defend women’s basketball often judge it a little differently than men’s, on the presumption that it’s a less mature sport. First, let’s introduce a simple proxy for “talent”: How rare is an athlete’s skill relative to her peers? Take, for instance, Serena Williams. Serena is Serena not because she has the fastest serve on Earth, but because she has taken on the best competition in the world, on the biggest stages in the world, and come out on top — 19 times. One of the reasons this is so impressive is that tennis is an extremely popular sport worldwide — among both men and women — and Serena has been better than a whole generation’s worth of opposition. That is, of the literally tens of millions of women who play tennis around the globe,1 she has been the best for a long time. The popularity and the competition both increase in college. As of 2012-13, the NCAA had 1,090 women’s basketball teams (the most of any sport — women or men), although getting a spot on one of them is still harder than for other sports. There are approximately 27 high school basketball players for every one spot on an NCAA roster and 87 for every spot on a Division I roster. 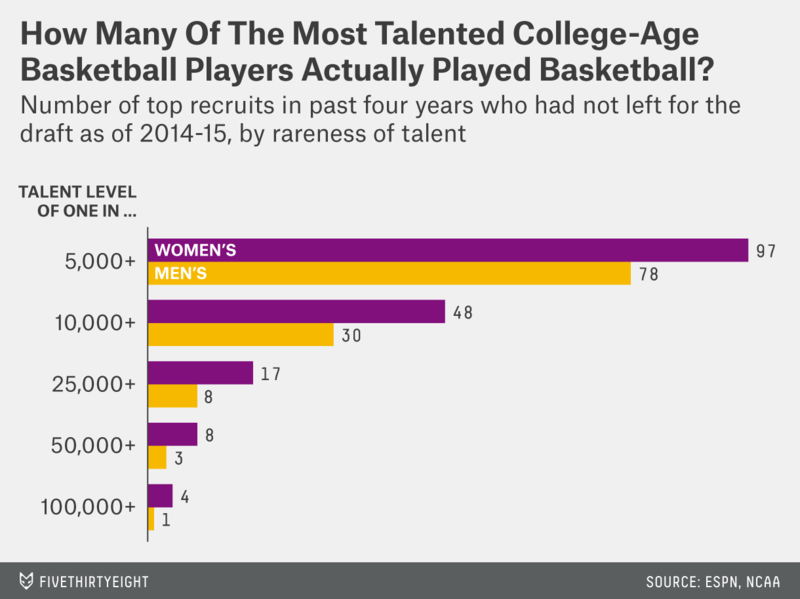 At least by this metric, it’s fair to say that basketball — both men’s and women’s — requires the most “talent” (among team sports) to play at the college level. It may also be worth noting that about 22 percent of female high school athletes who play team sports play basketball, compared with 17 percent for men. Meanwhile, female college basketball players make up 20 percent of the athletes who play top team sports, while men’s basketball players make up 11 percent. With a higher relative participation and fewer tempting alternatives for women athletes, college women’s basketball is likely to be receiving a very large share of the total female athletic talent. Of course, the top basketball teams — the type you are likely to see when watching the championship tournaments — feature much stronger talent. To get a better sense of the relative depth of women’s and men’s basketball, we have to look at both how good the top players are and how that talent is distributed across the players’ respective leagues. ESPN maintains “top 100” prospect lists for both men’s and women’s basketball. While skill will change over time, this provides us with a pretty good snapshot of the highest-ranked talent entering college. For individual teams, one way to boil down their recent recruiting prowess is to look at the top five recruits they signed over the previous four years (corresponding to the typical college stint). This tells you the top five prospects a team could theoretically put on the floor. For example, over the past four years, UConn has recruited two No. 1 overall prospects: Kaleena Mosqueda-Lewis (2011) and Breanna Stewart (2012); a No. 2 overall: Moriah Jefferson (2012); a No. 6: Morgan Tuck (2012); and a No. 14: Gabby Williams (2014). Or, shorthand, UConn’s four-year recruiting class was a 1-1-2-6-14. It’s no wonder the Huskies have been so dominant! So five of the top 10 teams were male, by this limited measure. But, of course, this has a couple of shortcomings: First, averaging ranks is probably not a great indicator of overall strength. 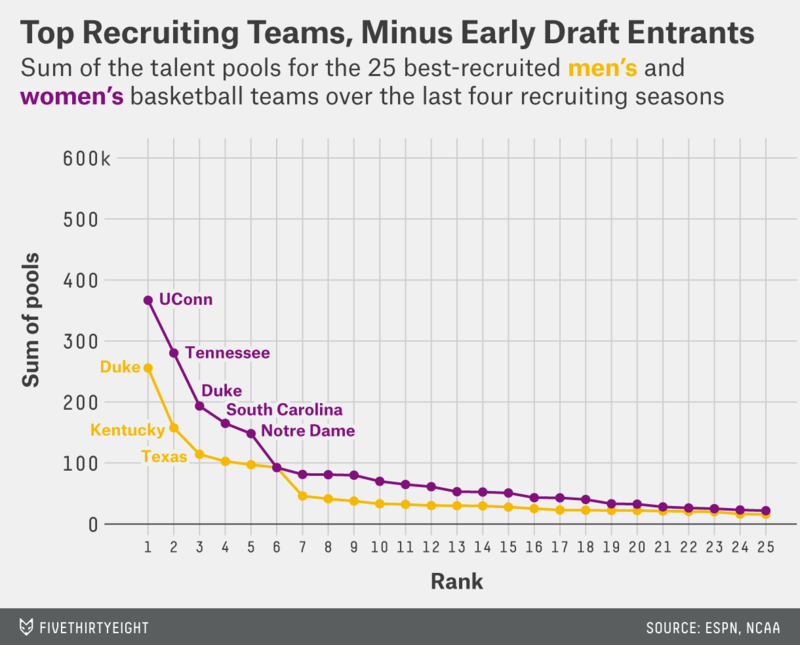 For example, Tennessee’s recruits have a slightly lower average rank, but most people would probably take UConn’s.5 Second, the men’s recruiting prowess is slightly understated relative to the women’s considering that the top recruits come from a slightly larger pool (as I mentioned above). To adjust for all this, rather than looking at raw rankings, I’ve rated players by their percentile among graduating high school players in the year they were recruited.6 This allows us to fill in the blank in the phrase, “She’s one in a ________.” For example, because Stewart was the No. 1 ranked prospect in her class, “she’s one in a hundred thousand” (OK, 124,539 — give or take). 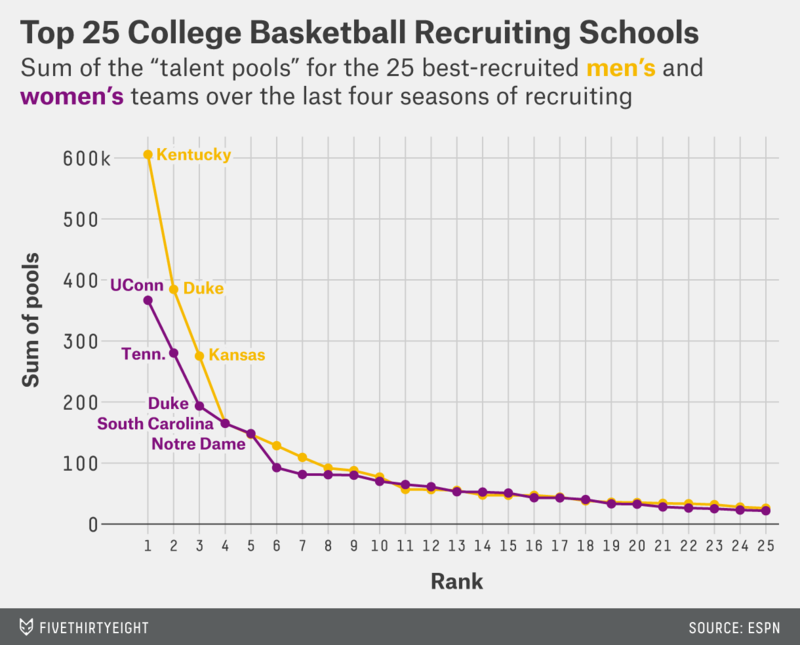 Using this method, in 2014, 71 college basketball teams had four-year recruiting classes that included at least five “one in a thousand”-quality players: 36 were men’s and 35 were women’s. Add the requirement that the team recruited a “one in 10,000” player as well, and the list whittles down to 21 women’s teams and 19 men’s teams. Require a superstar “one in 50,000”-type on top, and it’s pared down to 11 teams — six men’s and five women’s. All things considered, the distribution of talent to men’s and women’s teams has been pretty similar. While there’s no doubt that UConn has been the best recruiter among women’s teams over the past few years, it’s not any better at recruiting than we would expect the best recruiting team to be (unlike, say, their per-possession advantage, which is way higher than we would expect the highest per-possession advantage to be). Of course, one of the reasons that Kentucky’s men’s team is so good at recruiting is it has a lot of slots open up. By this measure, Duke leapfrogs Kentucky for the strongest recruits on its roster on the men’s side, and sure enough, Coach K is once again proven to be a genius. (Related: Recruiting strength is a fairly good predictor of success.) 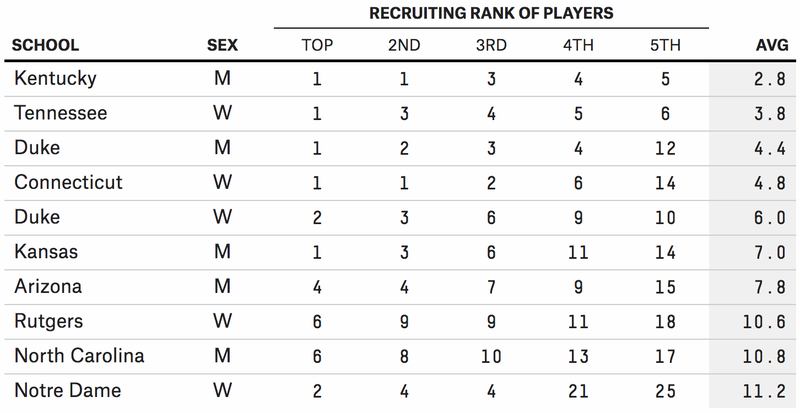 But with the men’s teams having lost 39 one-in-5,000 or higher players to the draft, the UConn women pull ahead of all of them as the team with the best recruiting pedigree overall. More importantly, essentially the entire men’s line drops significantly below the women’s. And while recruiting strength is a reasonable proxy for talent levels overall, note that the actual loss of talent to the NBA probably has a much larger effect, as many of the most-talented players who weren’t highly ranked coming out of high school depart as well. Which is to say, more of the best female college-age players play college basketball. The “downside” of having every great player stick around for four years is that teams get good. And they play together for long periods of time and get better. The effects of good recruiting — as well as good coaching — are more pronounced and last longer. In the women’s tournament, we have a much better sense of who the best teams are, and they play like it. You don’t get the “madness”-engendering scenario in which talented teams with no experience face off against experienced teams with less talent. The irony is that the lack of upsets in the women’s tourney is frequently cited as a sign of the sport’s immaturity or inferior talent. But the chalk likely results from the opposite: The women’s game is the more mature of the two. No doubt, the women’s tournament has a very different character than the men’s — and I don’t just mean the scarcity of dunks. Big upsets are extremely rare, and teams perform relatively closer to their expectations. But you don’t tune in to witness madness; you tune in to witness greatness. Estimates have put the total number of participants at over 75 million. Meaning sports in which players or teams compete head to head and are scored in wins and losses, thus excluding individual sports like track. It has maintained a total participation rate of around 400,000 since at least the mid-1970s, although other sports have gained in relative popularity. Volleyball and/or soccer may overtake basketball in coming years. 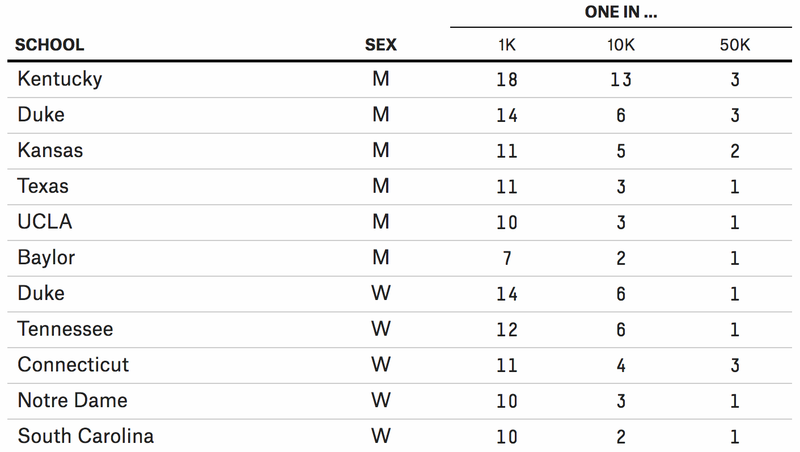 “Top” here means a team sport in the top 10 most popular sports for each gender. Both teams have a 1 and a 6, but I’d take UConn’s remaining 1-2-14 over Tennessee’s 3-4-5. I estimated each graduating class size as 28.6 percent (the ratio the NCAA uses for similar estimates) of the total high school participation for each player’s gender in the year they were recruited. Before this year, only two women who had remaining years of eligibility had entered the WNBA draft and only one had gone before her fourth year in college (Kelsey Bone, who left Texas A&M after her junior year in 2012).